For the last couple of years working in a high school, I have been trying to find some way to thank students for being kind. So much time is spent on what students do wrong, in school and out, and hardly any is spent on the things they do right. No act of kindness is ever wasted, but in our society of “what awful thing is happening right now” kindness is not very often recognized. Media outlets traffic in tragedy, disaster, evil, and shocking, if it truly is even possible to shock people anymore, events. Kindness if it is recognized at all is something they throw in for a second or two after we have been sufficiently inundated with the horrific. In schools, often times, it is the students who present challenges for teachers and staff that are talked about most. They are the students seen in the principal’s offices most. They are the students the media creates stories around. They are the students everyone sees and hears about. An assistant principal can spend the better part of the day in a high school dealing with discipline issues. It can become what those who work in schools look for and the thought of looking for kindness doesn’t cross the mind. Believe it or not, there are kind children who attend high school. I know many people may not believe this to be true because of all they read and hear, but I have seen it with my own eyes and heard it with my own ears. I think it’s past time to start to see this behavior more and perhaps we would see less of the less desirable behavior. Encouraging kindness allows more kindness to grow and in the pay it forward fashion to reach out onto the strings that connect us all. In that spirit, something I saw on Facebook last week has become my idea in action for my new office in the counseling department. 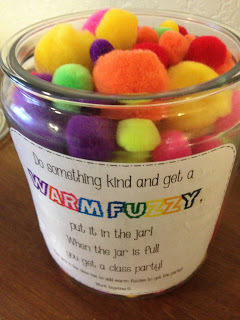 The Warm Fuzzy jar idea HERE will be transformed into this idea. I am not going to label the jar as a “kindness” jar. I will get some kind of jar and will likely apply some kind of appropriate Bronc Nation design and have it on the desk. Whenever I hear or see a student showing kindness, I will have them fill out a small slip of paper with their name on the front and the kindness they showed on the back. These will be placed into the jar and at the end of each week (if I can find someone to donate little gifts to give like cards for food places or some other little gifts), I will draw out a slip and that person will receive one of the little gifts. The slips will then be placed on some kind of display board all about kindness with the acts of kindness showing for all to see who come in the office. And each week, we will start the jar anew.